Um, Wow. Wowsy. Wowzers! Seriously, that is pretty much all I can say at this point! Wendy Wunder had me hooked on her writing since I first read(and re-read) The Probability of Miracles. Her writing style is so lyrical, and her ability to create the most diverse, loving characters is unlike anything I've ever read. She is truly a unique author! 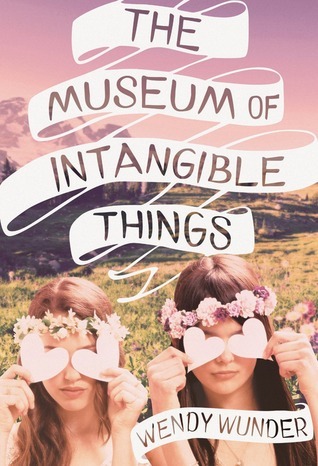 The Museum of Intangible Things follows suit with all of those qualities! Hannah was a character that I loved reading because she reminded me a lot of myself. She is a simple girl that works hard for what she wants. Although I don't share her family situation, we both share the same hard working qualities. She is a strong, loving character and has fierce drive! Her love for her best friend Zoe is not once questioned! Zoe was a wild free bird. She reminded me of a beautiful flower child that was born in the wrong generation. She was so vibrant. So colourful. She came alive, jumping out of the pages of the book! The wild adventure that Zoe and Hannah embark on is unlike any other Road Trip book you'll ever read. Trust me, that this one will have you laughing and shaking your head in complete amazement. Zoe thrives to live life fast, hard and to it's fullest. You can't help but be inspired by her character and want to adopt some of her "intangible things". The Museum of Intangible Things was a spectacular reading experience! Nothing was better than to curl up on a lawn chair and soak up the sun with this beautiful tale of 2 girls and the open road. You will laugh, and if you are like me, you will most likely cry!